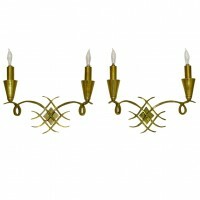 Pair of French brass 2 light wall sconces atrributed to Jules Leleu. Each sconce uses two 40-watt candelabra size bulbs. Rewired.